Miniature ion pump - AOSense, Inc. 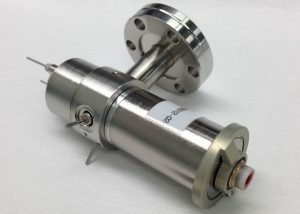 The IP-X ion pump is an ultra-compact 1 L/s ion pump with low stray magnetic field and a miniature high voltage connector designed for UHV applications. The patent pending IP-X ion pump design is ideal for applications requiring low magnetic field and compact form factor such as atomic clocks, laser spectroscopy and quantum physics applications. The proprietary magnet design produces a high internal magnetic field for improved pumping speeds while the fringe field is >50x lower than conventional magnet designs. Bakeable to 450 °C for UHV applications (with magnet and high voltage cable removed). 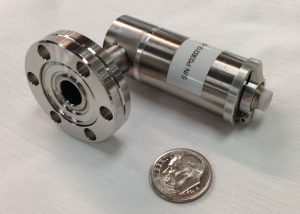 Note (1) F=1.33 for 1.33″ OD mini CF flange (rotatable). F=1.00 for 1.00″ OD micro CF flange (fixed). CAD models available upon request. Please contact us for a quote or to discuss your applications.